You can help Pharmacist Support raise money for the charity’s services by doing something quick and easy: collecting stamps! The key to success is both the volume and the presentation of the stamps you collect. 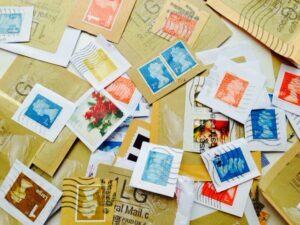 No sorting is required, just leave the mix as collected, but ensure that you leave about 4-5mm of paper around the stamp. Enlist the support of your colleagues, friends and family and engage with local businesses who receive large volumes of mail, particularly from overseas. Foreign stamps (including the Isle of Man and the Channel Islands) are worth more so please separate them out from the British ones and Pharmacist Support will receive more funds. Un-franked stamps that have gone through the mail without being marked are no longer valid for postal use. It is illegal to re-use them but they are OK for stamp collecting, so do leave them in the mix. How easy is that? By doing something so simple, you could really make a difference to pharmacists and their families in times of need. We very much appreciate your help.